When my girls are away, their mom will play. Summer is still in full swing here but fall, and another school year, is quickly approaching so I decided to surprise my girls while they are away at camp by sprucing up their work area in our sunroom. Once school begins, clutter from notebooks, pens, pencils, post-its, books and papers galore descend upon us. They needed a space to work with lots of storage so they can stay organized and I can stay sane. Our sunroom is a space we all use to watch tv, work and hang out so I was dying to make it more functional (and pretty)! I teamed up with ATG Stores once again (remember my amazing farmhouse table in my kitchen) to spruce up my sunroom as part of their #FreshForFall kickoff and get it ready for another school year. So out with the dining tables that were too deep and had absolutely no storage and in with a pair of matching computer desks with drawers. 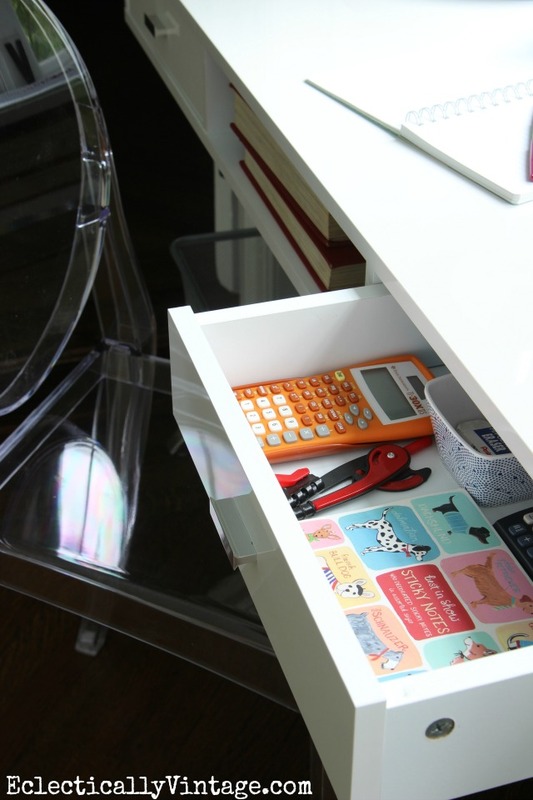 More storage comes from a little file cabinet with drawers perfect for notebooks, folders, books and other supplies that are within reach. Instead of stashing it under the desk, I thought one would be perfect between the desks. 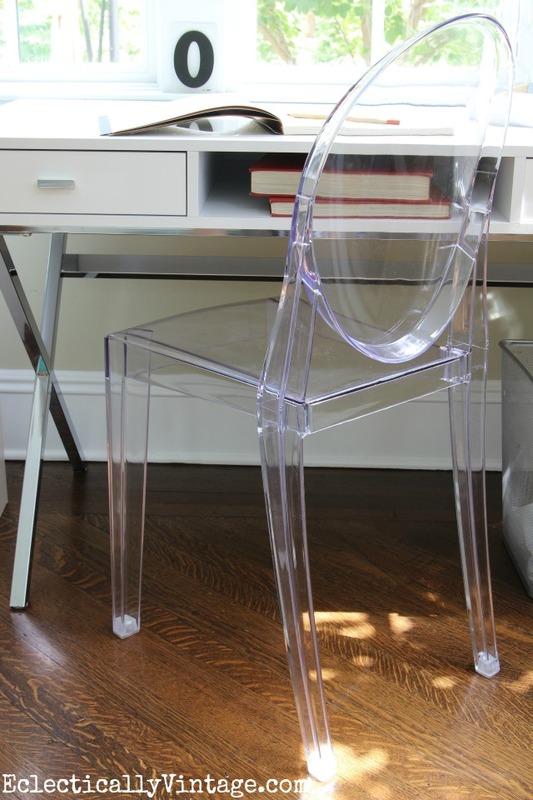 I LOVE these clear Casper chairs! They add such personality without taking up visual space and keep the area light and airy (and put the emphasis on the view of our backyard). 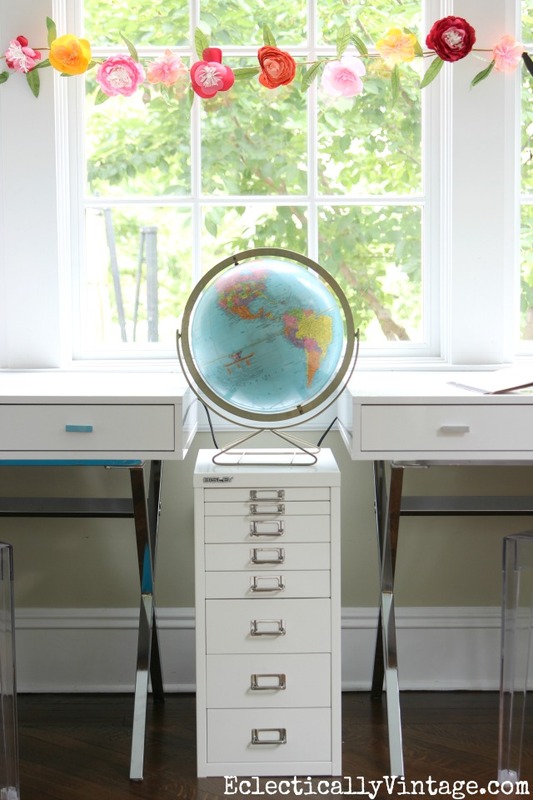 I really love the two desk drawers that each desk has and the center cubby – perfect for storing laptops. 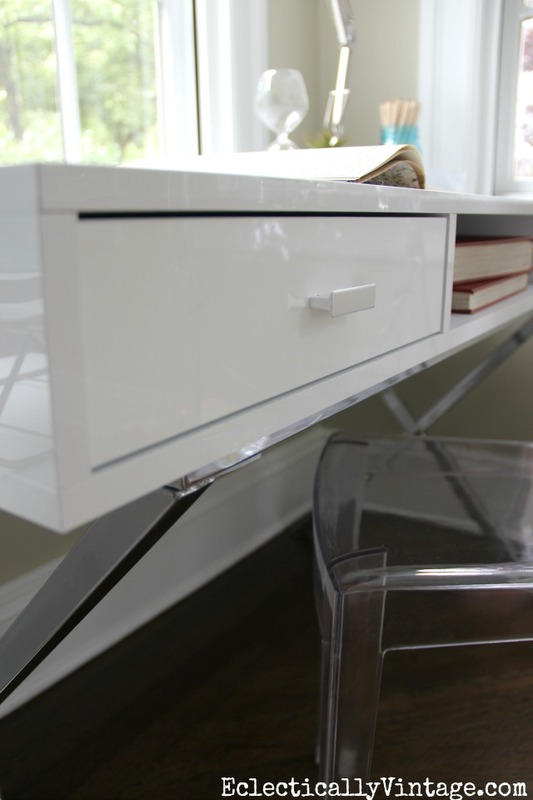 Sleek, shiny white surfaces and chrome are easy to clean. With all that hidden storage, it’s nice to be able to display only pretty things on the desk. I love the way their new homework area blends seamlessly with the rest of the sunroom. now let’s hope they can keep it looking this tidy! Follow #FreshForFall to see more spruced up front door areas, foyers and work areas. 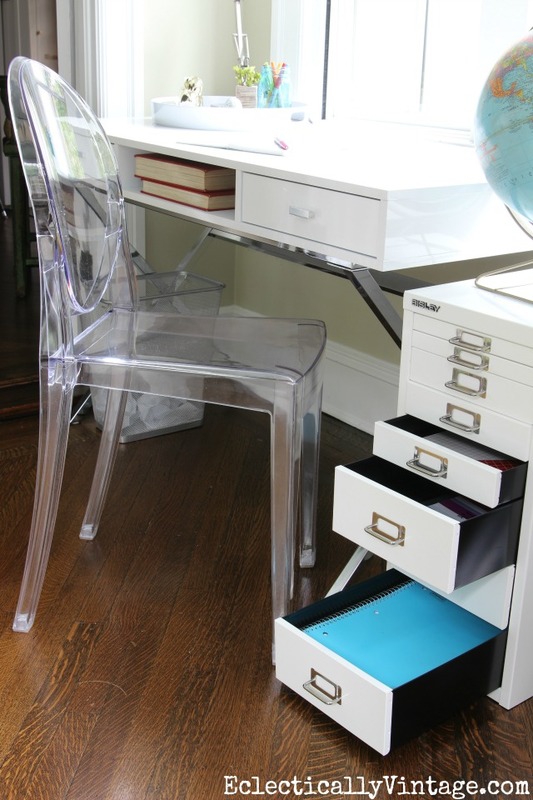 Computer desks, Casper chairs and under desk file cabinet can all be found at ATG Stores. As always, thank you for supporting the brands that make this blog possible. Great space for the girls and a super mom. Wish I had a place like that when I was young! Very nice! Where did you get those sweet flowers on the window? Flower garland is from Target last year Sharon! What an awesome and adorable space for your girls to get their homework done! I’m sure they’ll love it!! 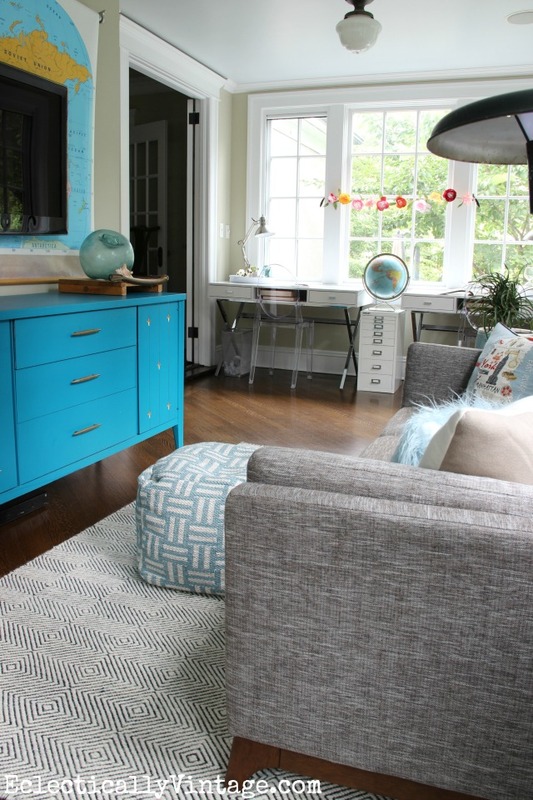 This study area is the perfect spot for homework and daydreams! Love the desk and of course, you know I’m a fan of the chair! Good job what a mom you are. 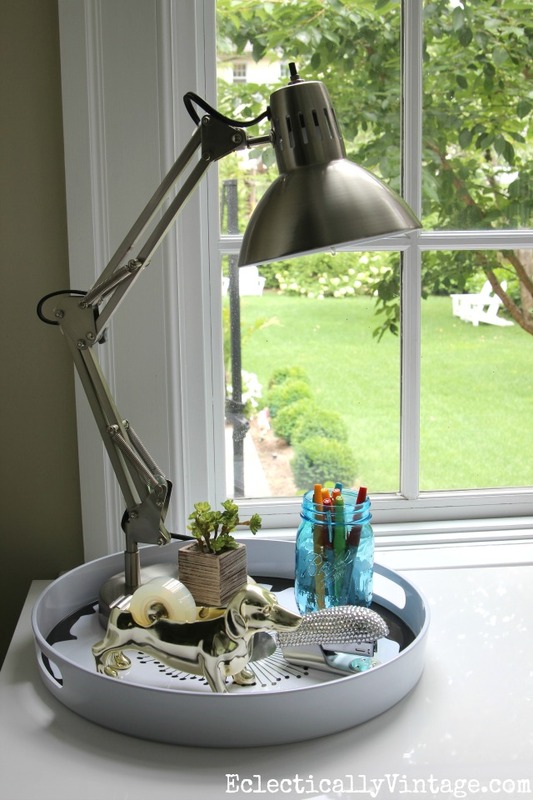 You always find some interesting things to decorate with,the stapler and tape dispenser are sooo cute! I know they will thrilled. Great space- maybe they won’t mind doing their homework now! Love the clean bright colors. Looks great. I like how clean and uncluttered it looks. I’m thinking about purchasing the desk. Did you have to assemble the whole thing or I know a lot of desks come w/the top already assembled and you just have to put together the legs. We assembled the whole desk Gina! It was a lot of pieces and took awhile but in the end I love how it turned out! What color are the walls in this room?